The Yezidis by Birgül Açıkyıldız is an important contribution that will shed light on a mysterious and much maligned community, writes William Eichler. It will also help us to better understand the horrific events going on in the Middle East at this very moment. The Yezidis: The History of a Community, Culture and Religion. Birgül Açıkyıldız. I.B. Tauris. 2014 / 2010. The Yezidis have been thrust onto the world stage in the most horrific of circumstances. Last August, the Islamic State of Iraq and Syria (ISIS) trapped tens of thousands of this religious minority on Mount Sinjar in northern Iraq in an attempt to annihilate their entire community. Despite its medieval rhetoric and methods, ISIS is a distinctly modern group. Its genocidal, totalitarian ideology and drive to create a homogeneous state festooned with flags are characteristics associated more with the 20th century than earlier periods of Islamic history. However, in their quest for dominance they exploit pre-existing cleavages and mobilise older prejudices; a fact evident in their treatment of the Yezidis, whom they deem to be ‘devil-worshippers’. The Yezidis are a predominantly Kurdish-speaking people who number somewhere between 700,000 and 1,000,000. They live predominantly in northern Iraq where their most important places (the Valley of Lalish and Mount Sinjar) are located, but there are also small communities in Syria, Turkey, Armenia and Europe. Their precise origins are unclear. Yezidism is passed on in an oral tradition by men of religion or qewwals and it was not until the 20th century that their two holy books, the Mishefa Resh (the Black Book) and the Kiteb-i Cilwe (the Book of the Revelation), were published, and so the task of unearthing their exact beginnings is difficult. However, through the study of their traditions and references in non-Yezidi texts it is possible to build up something approaching a coherent picture of their past. Their location “at the crossroads of various religious, ethnic and linguistic communities” has meant that many different traditions have coalesced to form what is a highly syncretic belief system. According to Yezidi tradition, when the 12th century Sufi scholar Sheikh Adi left Baghdad, the capital of the Abbasid Caliphate, to form his own dervish order in the Mosul region of Iraq, he came across a group of local people called Shamsani. They were followers of the ancient Iranian religion Manichaeism, but they were so impressed by the Sheikh’s personality and mystical ideas that they joined him. They did not abandon their beliefs. Instead, the two sects – Shamsanis and Adawis (disciples of Sheikh Adi) – “developed mutual co-operation and defended against their common enemy, the Abbasids.” Over time, ancient Iranian religious practices blended with Sufi Islamic traditions, took on some Christian practices, e.g. Baptism, and Yezidism was born. Yezidis believe in one God (Xwede) who is the all-forgiving, merciful creator of the universe. A non-interventionist God, he is represented in the world by seven angels who are led by the Peacock Angel, or Tawusi Melek. While God is concerned only with the transcendental realm, he still manifests himself in the Holy Trinity of the Peacock Angel, Sultan Ezi (from whom the word “Yezidi” is derived), and Sheikh Adi. 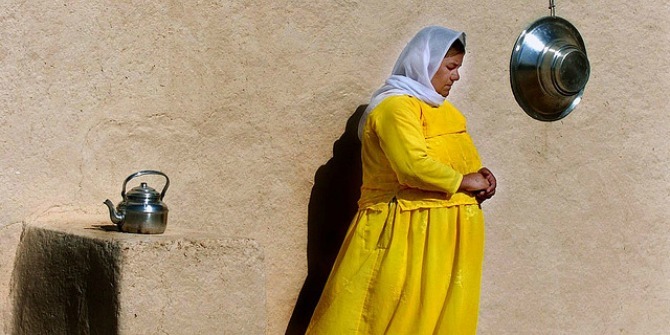 The pre-Islamic Iranian roots of Yezidism are evident in the day-to-day practices of Yezidis. They consider the sun, stars, fire, water and earth to be sacred; they use fire during religious ceremonies; and they believe in reincarnation. The community is also divided into two rigidly adhered to casts: a clerical caste (Sheikhs and pirs)and the general public (murids). This latter practice has led some to posit a connection with Hinduism, but Açıkyıldız appears to reject this, claiming “it differs from the Indian system because there is no ranking”. Historically, Yezidis have been viewed with suspicion by Christians and Muslims, and persecuted by the Islamic rulers they have lived under. The Ottomans alone were responsible for 72 massacres against them. The Hanbali scholar Ibn Taymiyya (a thinker whose ideas have helped shape the world view of ISIS) wrote a treatise about the Adawis, explaining, “They devoted to Sheikh Adi and to Yazid an excessive veneration, incompatible with the doctrine of the great Sheikh Adi. In fact, the teaching of the latter was orthodox and did not admit any of these innovations”. One of these “innovations”, or deviations from Islamic orthodoxy, is the figure of Tawusi Melek, and it is the veneration shown to this angel that has led to Yezidis being branded ‘devil-worshippers’. In the Mishefa Resh, the Peacock Angel is identified with Azazil, also known in Islam as Iblis. In the Koran, Iblis defies God’s command for him to worship Adam and was therefore cast out of Paradise. Thus, Iblis became the Devil. For this reason the veneration shown by Yezidis to the Peacock Angel has been interpreted as devil-worship by many in the region. However, for Yezidis (and some Sufi scholars), Iblis’ refusal to worship Adam was evidence of his love for God who subsequently rewarded him by placing him in charge of the other angels. The different interpretations of the story of the Fall has led to them being persecuted repeatedly with the murderous campaign by ISIS being only the most recent example. Professor Açıkyıldız’s history suffers from a couple of small weaknesses. It has been poorly proof-read making it difficult to read at times and the final chapter on “Material Culture”, which intricately describes every aspect of Yezidi architecture, will be of interest to a specialist in the subject but will prove quite dry for a general readership. These, perhaps pedantic, points aside, The Yezidis is an important intervention that will shed some light on a mysterious and much maligned community. It will also help us to better understand the horrific events going on in the Middle East at this very moment. William Eichler has a BA in Philosophy and Politics and an MA in Middle Eastern Studies. He is a freelance journalist and part-time English teacher who lives and works in the UK and Turkey. He blogs at Notes on the Interregnum: Essays and Reviews and you can follow him on Twitter at @EichlerEssays.Read more reviews by William.